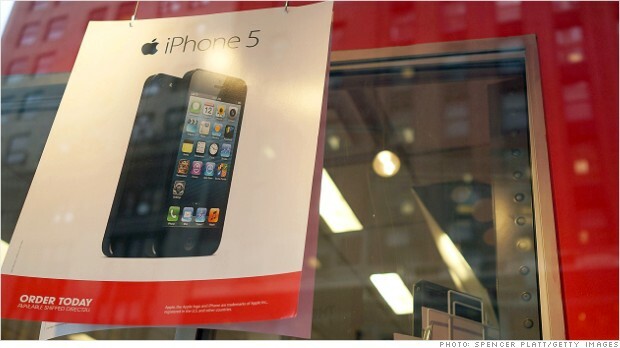 Analysts warn that iPhone 5 sales could be weaker than expected in the current quarter. It's been a rough week for Apple. And it's only Tuesday. Apple (AAPL) shares slid 1.4% to $431.82 in afternoon trading. The selling came after Jefferies analyst Peter Misek issued an unflattering report on Apple, adding to a string of negative research published on the company this week. Misek cut his estimate for iPhone sales, lowered his price target to $420 a share and said there is a 25% chance Apple will miss its own earnings expectations this quarter. But the report was a few days late and $1 short for some traders on StockTiwts. 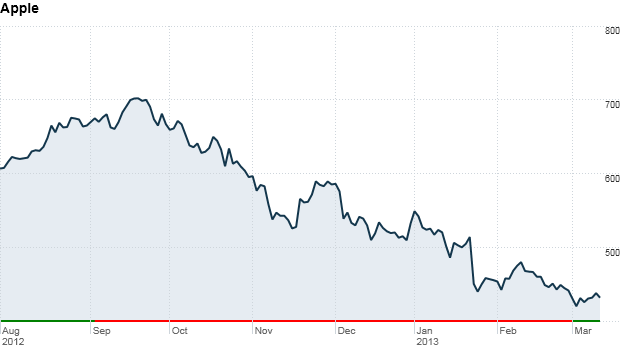 Apple shares fell to a low of $419 a share last week. $AAPL little late on that $420 call Jefferies. That target was hit last week. Now we know who will be forced to cover shorts on strength. $AAPL this guy from Jeffries is epic "HE IS SORRY HE DIDNT SAY TO SELL IN SEPTEMBER!!!!! ":D Thats right, sell at 52wk lows. What a joke. After hitting an all-time high of $705 a share last September, Apple shares have lost more than a third of their value in about six months. The sell-off has been driven largely by concerns about waning demand for the iPhone and uncertainty about Apple's future under CEO Tim Cook. $AAPL Too much for Cook to handle. AAPL needs a voice behind it. Not just a production ace in the back room.Good at his old job, not this. Cook had been chief operating officer before taking the helm. Misek's report cited supply-chain problems related to certain iPhone parts that could delay new product launches later this year. On Monday, analysts at Topeka Capital and Baird Capital both raised concerns about iPhone sales based on checks with Apple suppliers. Also on Monday, CLSA analyst Avi Silver cut his price target for Apple shares to $505 from $575. Despite the flurry of ugly research, Apple shares rallied late Monday on rumors the company could issue a special dividend or buy back shares. $AAPL down about 1% pre-market. So the latest special dividend/buyback rumor pop lasted for all of an hour and a half yesterday? Those rumors have been rampant since hedge fund manager David Einhorn launched an activist campaign to unlock some of Apple's $137 billion cash hoard. But the rebound was fleeting and traders were once again bashing Apple early Tuesday.